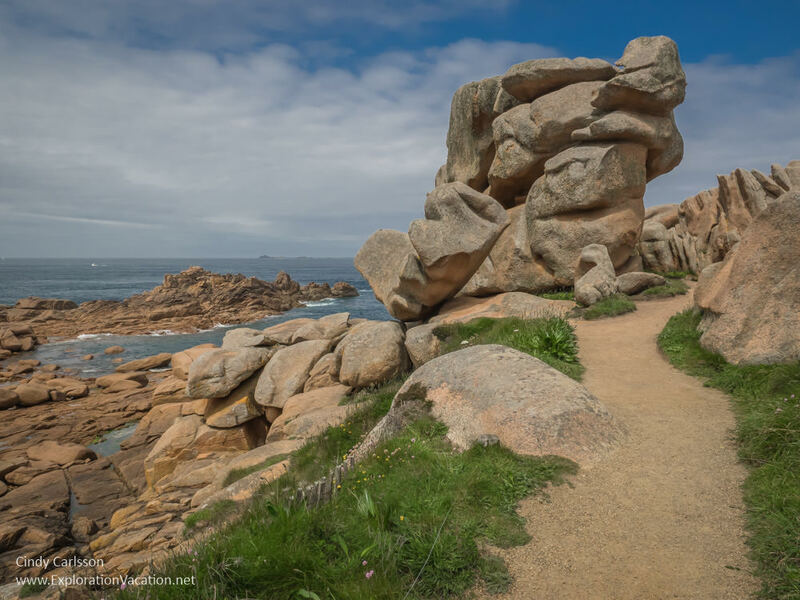 There are many lovely spots along the coast of France, but Brittany’s Pink Granite Coast – the Côte de granit rose – has to be among the most intriguing. 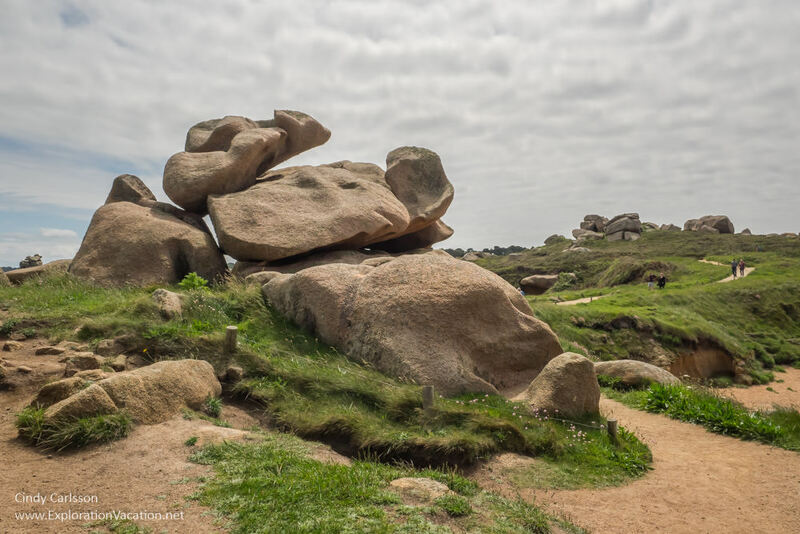 Dramatically weathered pink granite outcroppings sprout from the coastline of northern Brittany. The most colorful of these are located around the Ploumanac‘h lighthouse between the beaches of Perros-Guirec with the port of Ploumanac’h. All of the rock in this area is granite, but it varies in color depending on the amount of pink feldspar it contains. Around the lighthouse, the granite outcroppings may be grey (the predominant color along most of the coast), pink, or red. Along with the mineral content, the color also changes with the strength and direction of the sunlight. This makes for an ever-changing kaleidoscope of colors. 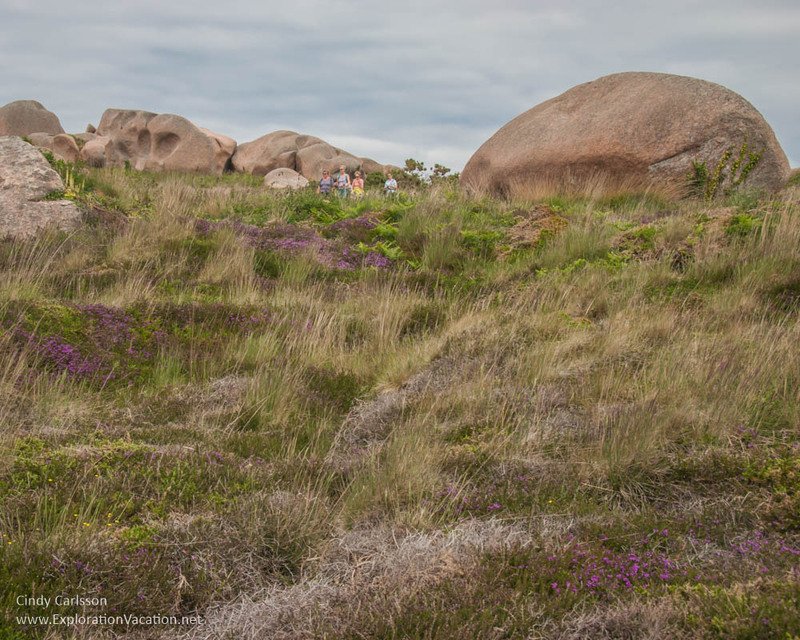 Walking along Brittany’s Pink Granite Coast on a spring day offers a beautiful mix of dramatic scenery and colorful flowers. This part of France is a popular seaside escape, so there are lots of lodging options in the area. Perros-Guirec, in particular, is noted for its seaside cottages and resorts. The area’s rock formations can be viewed along the Sentier des Douaniers, an old customs patrol path along the coast that dates back to the time when this coast was known more for piracy than beach resorts. 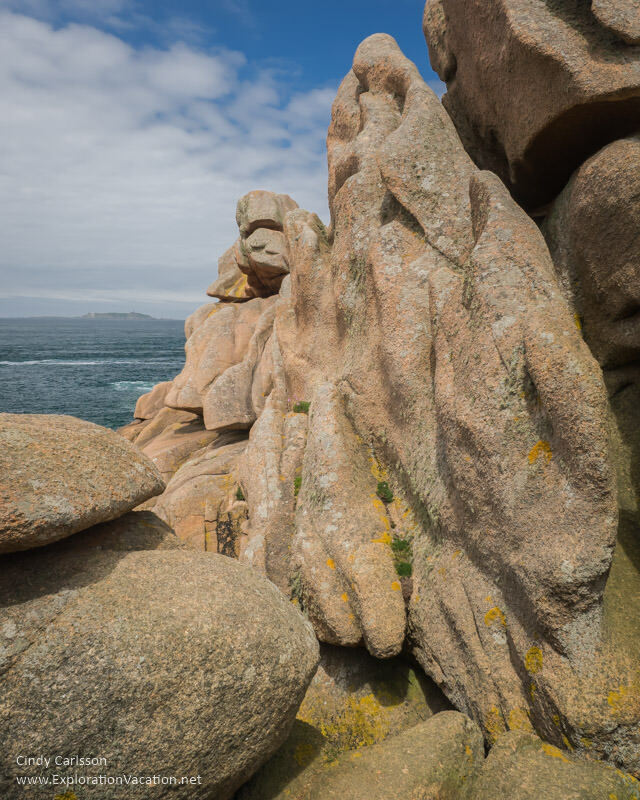 The most colorful and interesting formations are located between the beaches of Perros-Guirec and the harbor in Ploumanac’h. It is an easy two-mile hike between these villages. However, there is also visitor’s center with a pay-to-park lot near the Ploumanac‘h lighthouse. 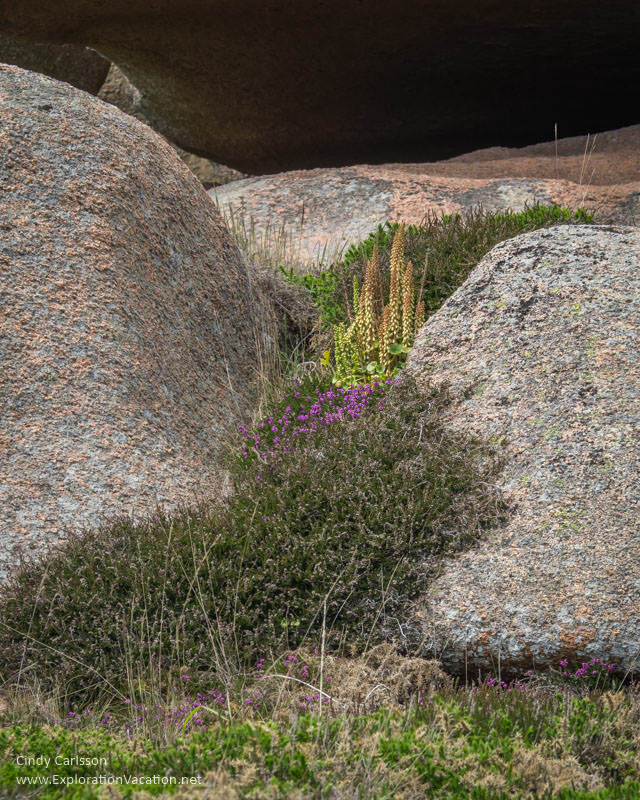 Because Brittany’s Pink Granite Coast is a popular stop, expect the parking lot and trails to be crowded. This is especially true during the summer holidays. There are places along the trail where visitors can walk along the beach and climb on and among the rocks. However, with so many visitors, much of the area near the lighthouse has fences and designated paths to reduce damage to the rocks, vegetation, and visitors. Fortunately, the fencing is pretty discreet, so it feels as if you can wander wherever you want, even if you can’t. OK so that’s what I missed! I was SO close to Perros-Guirec but simply didn’t have time to visit when I was there in May. Your photos are beautiful so now I’ll have to go back! Yes, Janice. You should go back – you need it on your website! It is very beautiful and quite different from the rest of the Brittany coastline (at least from what we saw). How lovely. 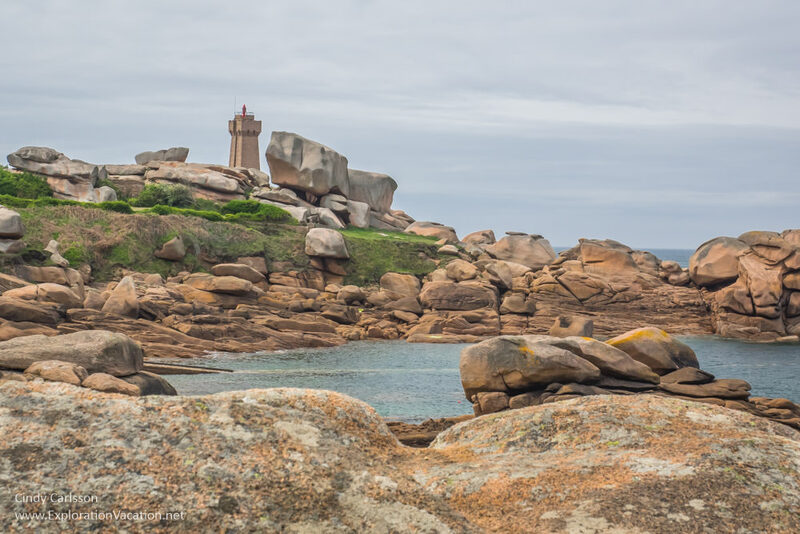 I enjoyed visiting Brittany but I had no idea the Pink Granite Coast even existed! I thought there were way too many things to see in Brittany! The Pink Granite Coast is a small area, so I can see how it would be easy to miss. I know I missed all sorts of other things… Thanks for stopping by! 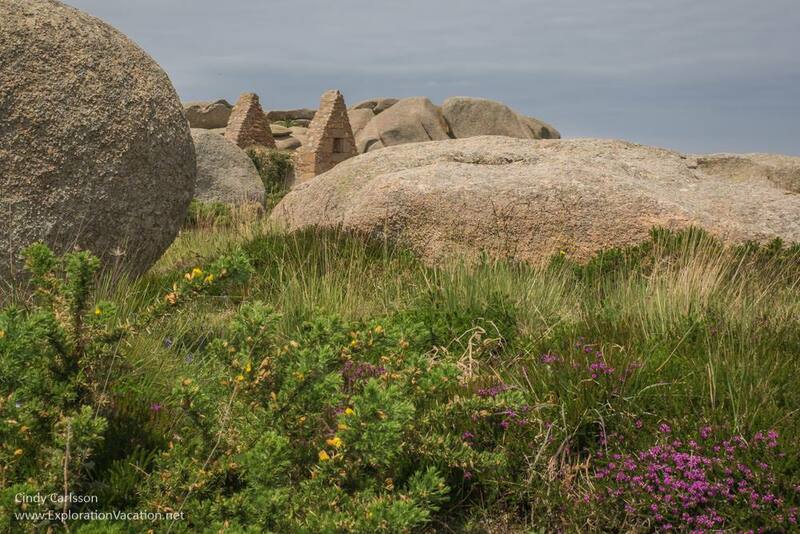 Thx for this interesting post on Brittany’s Pink Granite Coast, Cindy. LOVE that spotted orchid! Thanks! And thanks for the flower ID – usually I follow up on that sort of thing, but hadn’t yet. There were quite a lot of wildflowers and a few orchids. There were big patches of these spotted ones! I am always amazed at all the beauty there is in the world; the locations I am learning about and want to visit. I enjoyed looking at your beautiful photos!! There are just so many beautiful places, aren’t there? 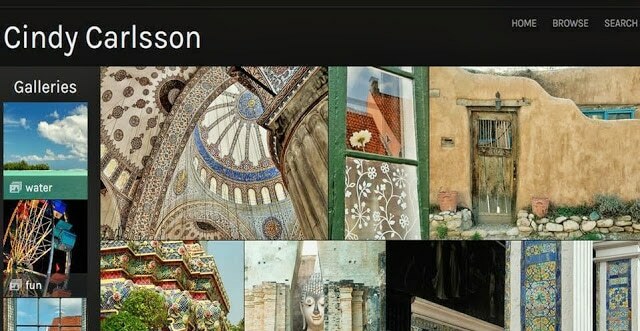 It makes photography a lot easier!